New Albany maintains approximately 236 lane miles of roads during winter months by placing de-icing liquids, plowing snow and dispensing salt. This represents 248 total streets including residential, commercial and highway roads. Crews also clear snow from public parking lots and sidewalks on publicly owned property. Snow removal operations are scheduled for 24 hour service as crews work shifts in order to make roads safe and passable during winter weather events. For each snowfall event it is our goal to have every street cleared within 24 hours after the snow event ends. New Albany’s snow removal priorities begin with clearing highways and our most highly traveled roadways and streets, also known as arterial roads. Emergency travel for fire, emergency medical and police personnel is the highest snow removal priority. The second priority is to facilitate traffic moving in and out of the city by clearing collector roads. These are typically roadways which carry traffic in and out of residential areas, as well as those surrounding the Learning Community Campus. 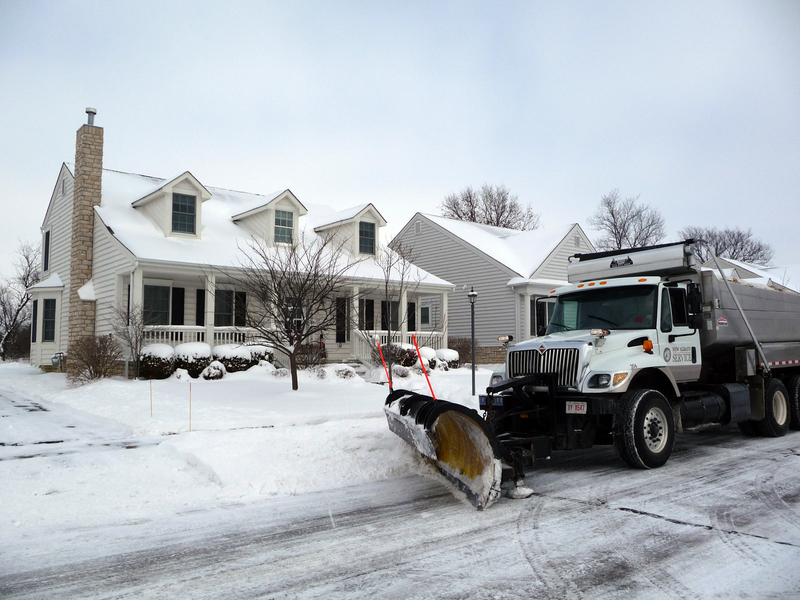 Low volume roadways which consist of courts, alleys and other residential streets are cleared last, as they carry the lowest amount of traffic. The number of trucks assigned and the plan implemented during any given storm is dependent on the severity of the event. Prior to plowing, crews may spread salt and other deicers to help prevent snow and ice from bonding to the pavement. During intense storms the spreading of deicers may be discontinued and crews will plow until such time as snowfall stops. As the last step in the cleanup from a storm, the area of the street adjacent to the gutter will be plowed back. This is done to allow melting materials to run off and ultimately reach the gutter. This will lessen the amount of icy patches that happen during evening refreezing. Residents and businesses are reminded that they are responsible for clearing their walkways. Public service crews recommend shoveling snow away from the street at driveways so that snow is less likely to get pushed back onto the driveway or sidewalk by a passing snowplow. This should be done by piling snow to the right side of the driveway (on two-way streets). This allows snowplows to reach the snow pile after it passes the driveway. Keep in mind that for the postal service to maintain mail delivery, snow must be cleared in front of mailboxes for proper access. Patience is a virtue when traveling in snow storms. Motorists need to give themselves more time to drive to their destinations, not follow salt and plow trucks too closely, and not attempt to pass salt trucks. If these simple steps are followed, motorists stand a greater chance of reaching their destination safely. Emergency travel for fire, emergency medical and police personnel is the highest snow removal priority.